We came to a casino. We are in a good mood. We have got some cash. We buy some chips and play some slots, and then we get in the casino free drinks. Then we want to play some poker but we don't even have idea about the game, so we simply stare at others. How does the casino play against the visitors, if everything is so nice and shiny inside? Well, we should always remember the house wants us to leave there as much money as possible and come back again. They do not like very lucky people, who beat the house. They do not like the cheaters, whom they try to find and send to jail. We can understand them, because each dollar, left in the casino is their income and they want to get everything from players to the last cent. The house sets the minimum and maximum bets. Why? Because they want to secure themselves. For example, minimum inside bet is $5. You can split $5 into five $1 chips. At the same time, the minimum outside bet is $5 too, but you can't split it. The same story is with the maximum bets. Some casinos establish it at a rate of, let's say, $1 500 and the winning is $52 500. Not every casino is ready to pay out more than that at once. Free drinks are offered to the players. Why? Because they stop thinking properly and start doing strange stuff like thoughtless bets, and their brain processes become weird. 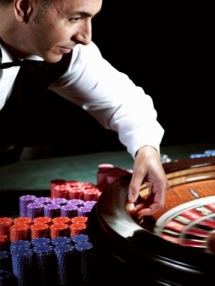 Tipsy or even drunk people cannot beat the casino by default. You should always remember that only sober mind can at least try to break the bank. You might argue because there are no systems to beat the house. But even if you have some winnings, you might lose some of them. Quick helpers can steal some chips from, which is not a very inspiring perspective if you intend to gamble in a long run. Don't forget about bankroll management, again, if you are going to become soothing better than a losing amateur. If you are using any systems or systems for winning, just keep in mind that the casinos have already seen them all. If you think you are very inventive, your strategy would definitely remind of another well-known strategy. You should always play honest, no cheating. They see everything and notice everybody. And always remember - gamble for pleasure, not for disappointment!